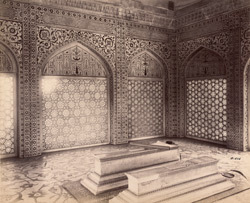 Photograph of Itimad-ud-daulah's Tomb at Agra in Uttar Pradesh, taken by Edmund William Smith in 1893-4, from the Archaeological Survey of India. This is a view of the cenotaphs in the interior of the upper chamber. The mausoleum was built c. 1625 by Noor Jehan, the favorite wife of the Mughal Emperor Jehangir (r.1605-27) in memory of her father Ghayas-ud-din (Itimad-ud-Daulah), and contains both his and his wife's grave. The Mausoleum, a white marble rectangular building, stands in a garden on a stone platform situated on the banks of the river Jumna. The delicately carved marble screens let in light and air, and these, together with the inlaid pietra dura work on the walls and floors, make this a most beautiful building. Smith wrote in Moghul Colour Decoration of Agra, 1901, "Over the domed chamber is another containing two white marble cenotaphs, surrounded by red marble (khattu) borders...inlaid with scrolls in bluish-black slate from Ulwar, looped together with small rosettes of white and a mottled marble, called abri...Between the tombs is a band of white marble studded with black rosettes of the same material with white centres separated with figures like Maltese crosses in mottled marble (dal-chana)...The tombs are not in the centre of the chamber. The floor around them is of marble mosaic...The ground is of white marble, and starting diagonally from the four corners of the floor and surrounding the tombs in irregular twists is a leaf scroll in marble of an old gold colour known in Northern India as khattu. Emerging at intervals from the concave side of the spirals are large leaves modelled after those peculiar to Persian, Arabian and Turkish ornament, which fill up to a great extent the vacant spacesbetween the meanders of the scroll. Underlying the big scroll and subordinate to it is another of intricate design in bluish-black stone. Issuing from the meandering sides of the scroll are flowers and leaves of variegated marbles. Surrounding the floor is a broad chain border of leaves in black stone, khattu and abri (jasper) inlaid upon a field of white marble."